This beautiful rug is unique, stylish and ready to accent your decor with authentic elegance. Add warmth & elegance to your house with the vibrant colors of our affordable collection. A non-skid backing eliminates the need for a rug pad and is safe for all types of floor. 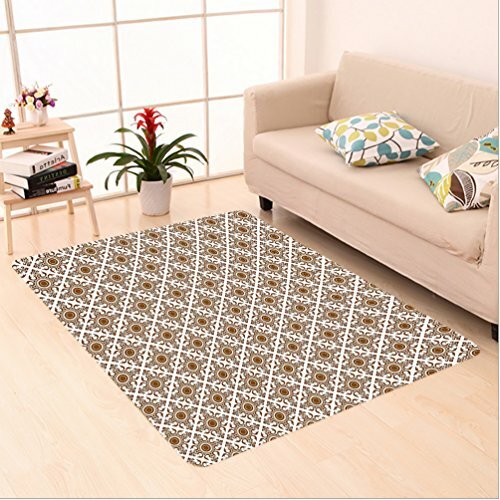 This is the perfect print rug for living room, bedroom, hallway, or wherever you want to add style and comfort. MATERIAL:100% Machine Made Polypropylene Rug,Features low pile that is very soft, stain resistant, and durable. Gentle hand wash separately in cold water.Super soft hand feeling easy to folded away compactly. View More In Area Rugs, Runners & Pads. If you have any questions about this product by Nalahome, contact us by completing and submitting the form below. If you are looking for a specif part number, please include it with your message. Nalahome Modern Flannel Microfiber Non-Slip Machine Washable Round Area Rug-Cartoon Thai Baby Elephant Kids Decor Colorful Natural Wildlife Animal Prints area rugs Home Decor-Round 79"
Nalahome Modern Flannel Microfiber Non-Slip Machine Washable Round Area Rug-nt Carved Gold Paint on Door Thai Temple Spirituality Statue Classic Image Magenta Golden area rugs Home Decor-Round 79"